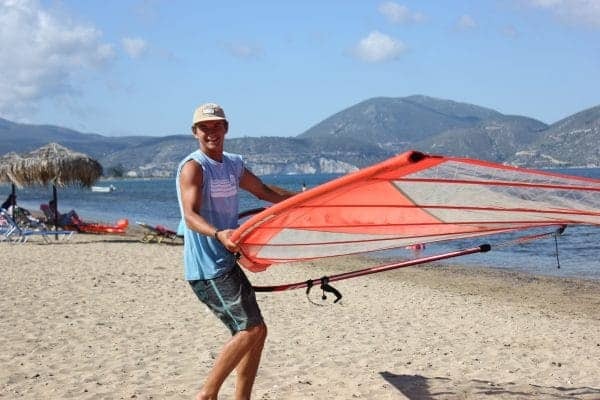 Both our active beach clubs in Greece really have excellent windsurfing conditions for all levels of windsurfers. Whether it’s your first time on a board or you’re already carving like a pro there’s nothing like windsurfing in crystal clear water in a pair of boardies. We’ve exclusive water sports areas at both clubs, and most of the time our guests are the only people on the water. Expect cross or cross off-shore conditions. Light morning breezes generally switch direction over lunch and build in the afternoon for more exciting windsurfing conditions that usually last until late evening. Already mastered the basics or a seasoned pro ? then you possibly don’t need any tuition. 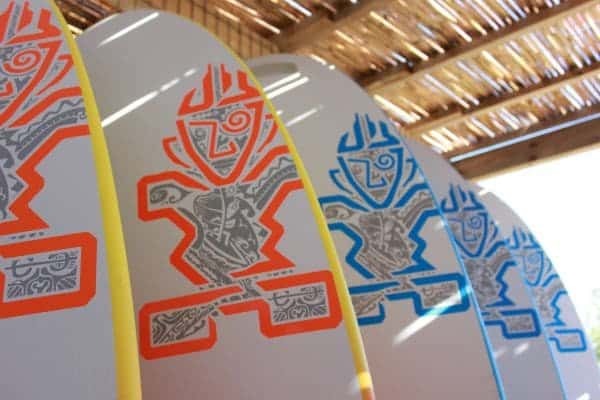 Grab some kit from the shack, it’s always rigged and ready to go, kick off the flip flops and blast away. If you need any help just let us know, our safety boats are always on the water and our team eager to give a helping hand or help you progress. As part of our beach club holiday package we offer inclusive daily clinics (group tuition sessions that last 2-3hrs). Beginner classes early on in the week lead to more advanced lessons as the holiday goes on. 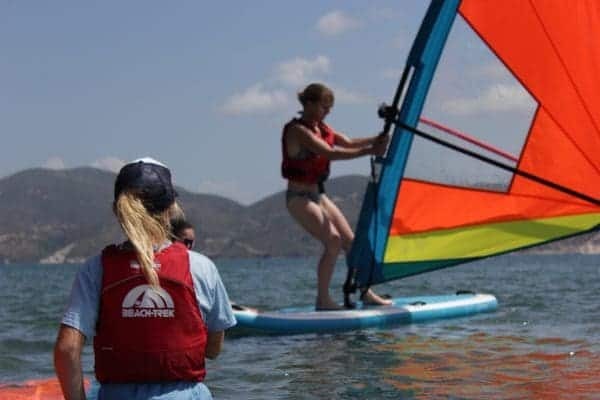 Our instructors talk you through the theory of windsurfing, run land and water demos, and get you out on the water as much as they can and as quickly as possible. 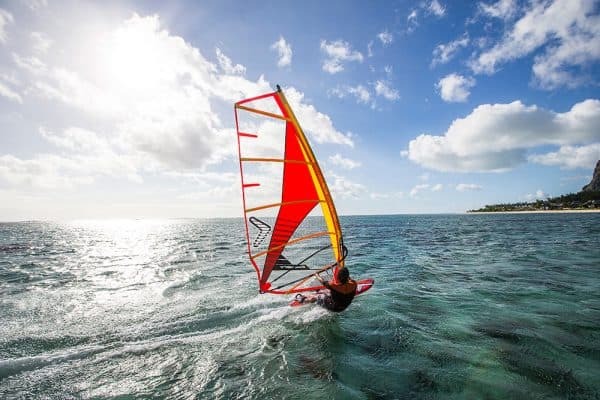 On a beach club holiday we focus on the basics of windsurfing in a relaxed environment in a stunning location. As part of the inclusive group clinics we’ll cover the following over an inclusive 2hr session. Safe sailing – the basic rules of safety in windsurfing, including an easy self-rescue technique to get you back to shore. Rigging of equipment – Correct rigging is important to learn and really helps feeling comfortable on the water. Launching and landing – Getting in and out safely and easily is super easy when you know how. Turning around – Sometimes known as Tacking and Gybing – it’s much easier than it looks. Sailing in all directions – Learn the skills to feel comfortable on a windsurfer in all directions. Theory – Some basics so you’ll understand the practical side of things when you get going. If you can sail a triangular course and tack and gybe this is for you. Boost your confidence by windsurfing in moderate winds and learn intermediate skills that will help improve your overall technique. As we pretty much have the windsurf area to ourselves, it’s a really good stress-free environment to practice these intermediate skills. Breezy afternoons and cross/cross-offshore conditions at both our clubs really help too. As you’re out on the water the majority of the coaching takes place from the support boats. During these sessions we’ll build up skills and develop technique in moderate winds, usually in the afternoons when the wind kicks in. Faster tacks, foot strap work and the beginnings of carve gybes are some of the techniques we’ll aim to cover. Our instructors will get to know your goals and plan sessions to suit your progression on and off the water. This is NOT included in the beach club package price and is charged by the hour with a maximum group size of 3 students to 1 instructor ( £25 per person ). We pride ourselves on having great kit that is regularly updated. As it is constantly changing feel free to get in touch to ask us for specific kit. Here are some of our current sails and boards.